I think we've all heard that guest posting is a great way to build your blog audience. By writing on someone else's blog, you gain exposure to their audience. Typically you will also get a backlink for your blog, which is great for search engine optimization (SEO for short). If you are the host, then you get content for your own site. But there are drawbacks to guest posting, too. It takes a long time to write a quality guest post and you are probably torn between posting the content on your own blog or writing for someone else. As a potential host, you have to evaluate and decide if the “guest” is genuine or just looking for a backlink. As a host, you have to proofread the post and confirm that there are no image copyright issues with the photos or create your own. Because of the work involved, I find that I do very little guest posting or guest hosting (if that is a thing). So I was really excited to come across this free resource: The New Blogger's Guide to Guest Posting. Now, don't be fooled just because it says “New Blogger's”. 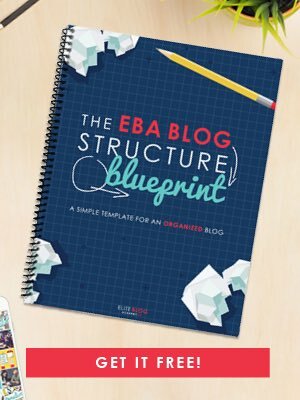 This guide is actually helpful to ALL bloggers, no matter how long you have been blogging. How to make guest posting a win/win for all parties involved. When, in your blogging journey, should you start guest posting? Steps to take before you pitch a guest post. As a host – who you should accept posts from. But recently I came across an excellent example. It really made me sit back and say wow! – so I want to share it with you. 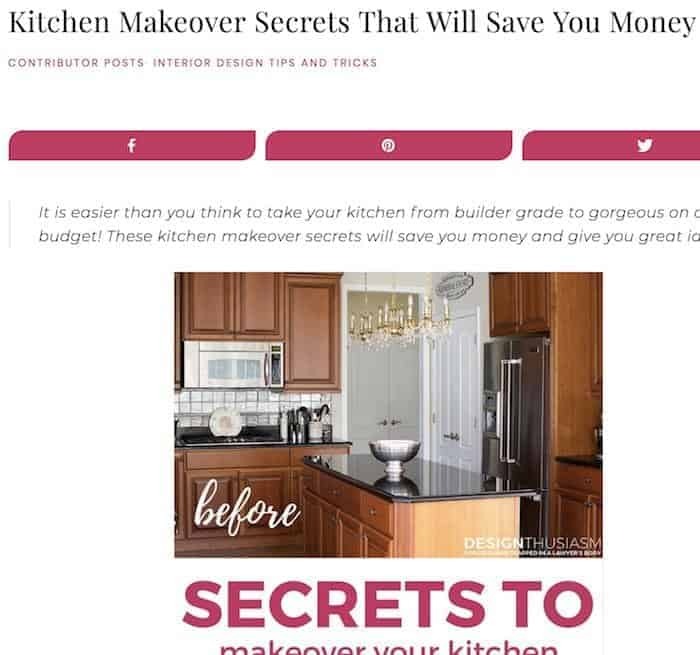 Tasha Agruso who blogs at Designer Trapped in a Lawyer's Body, recently posted this article titled Kitchen Makeover Secrets That Will Save You Money (see screenshot below). Since I am deep in the middle of my own kitchen renovation, I landed here looking for flooring ideas of all things. At first, I didn't even realize that this was a guest post (written by Lory at DesignThusiasm). The article is filled with helpful information and photos that are so useful to anyone that is thinking about remodeling their own kitchen. It isn't filled with tons of links or fluffy, shallow information. As I read through the article, I slowly began to realize that this was actually a guest post (it does say that at the beginning of the article but I think I scrolled right past that part at first). Honestly, I just couldn't believe that someone wrote such a detailed and informative article for a blog that wasn't their own. But when I got to the end, I realized that Tasha and Lory had done something really clever. 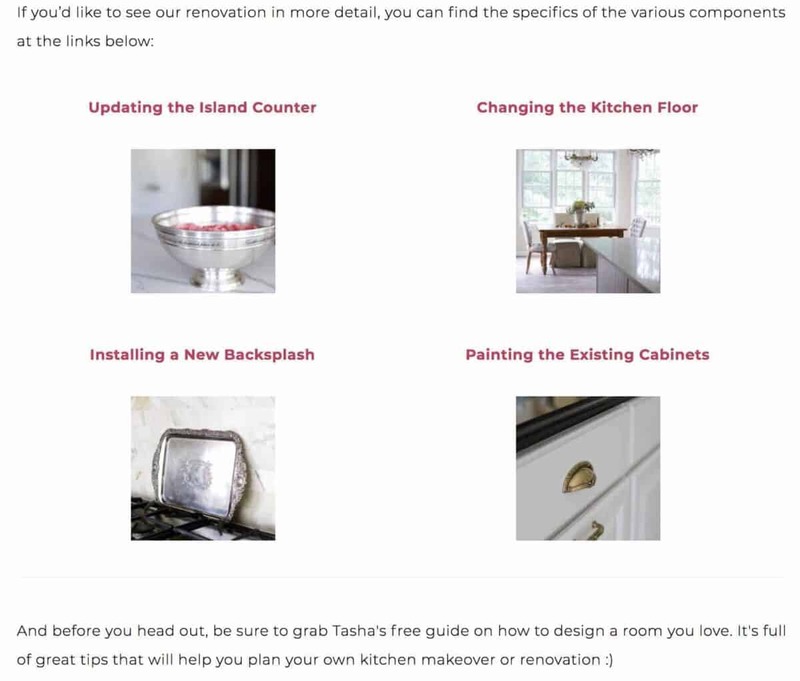 Each one of the images and links leads to related articles on Lory's site that discuss each phase of her kitchen renovation in even more detail. The guest post that Lory wrote for Tasha was a summary of all the different pieces. I found myself flipping back and forth between the two sites quite a bit. This increases the pageviews for both bloggers. A definite guest posting win/win. When you write or host a guest post – this is your ultimate goal. You want to provide great content to the readers so that they feel compelled to visit the author's blog as well as stay on the host blog. I encourage you to download the free New Blogger's Guide to Guest Posting. Use the information in the guide to come up with your own guest posting strategy and create your own win/wins. Once you read through the guide, if you would like to submit a guest post to my site – you can find the guidelines here. If you haven't set up your blog yet – learn the basics here. Great article you have here. Yes, we all talk and write about guest posting, but then, what is the core values of guest posting? You answered that question pretty well – creating backlink, exposure, etc. However, guest posting also presents you as an authority and expert in your niche. I have been guest blogging for a long time even before setting up my site. In fact, I got some clients via guest blogging because, as you mentioned, you have to create remarkable blog content to publish on someone else’s blog. What is a remarkable content? Content that adds value to your readers. In essence, guest posting is great, but knowing how to guest post the right ways is extremely important. Yes – you point out another great benefit of guest posting. When you share your knowledge with a wide audience or are featured on an authority blog or even several smaller blogs, people do start to recognize you as an authority in your niche. It is interesting that you started guest blogging even before having your own site. Clearly, it’s an important marketing tool. I think guest blogging got dinged by Google a while back because people were over doing it and not really providing value. But when done right, the results are good for all involved. I believe it’s my second time on your blog, and I enjoyed reading it. I’m not someone who does guest posting on a consistent basis, but I do believe that it’s an excellent strategy for building an audience because it begins with delivering value to others. If someone is looking to do guest posting for SEO, then it’s a dead end. Instead, try to build relations and get to meet new people. I highly recommend focusing on delivering the value and providing helpful content to the audience if someone allows you to post content on their blog. I want to add that guest posting is one of the best growth hacks for bloggers if done right. All the best, everyone. Great post, Neena. I agree – guest posting is also a great way to build relationships with other bloggers and other audiences. However, I think that we shouldn’t discount the SEO aspect. Generally, you will still get a link to your site from the host blog which is worth a lot. It’s the old techniques of stuffing the article with keyword links that doesn’t work. It amazes me that people still try to do it. Guest posting AND guest hosting are great ways to help more people solve their problems. People get trapped into thinking guest posting is so much work, because it’ only a good strategy IF you create killer content for the most. It doesn’t have to be 2 or 3 thousand words. It doesn’t have to have 12 images. Even as a guest host (which I frequently am)… you don’t have to host long, visually arresting content. It helps to some degree. That’s what your readers are interested in… and so should you be. PS: thanks for the guest post “Guide” link… I’ll certainly share that with my students/clients because many of them are very interested in guest posting. You are so right – guest posting is all about adding value. It really boils down to the attitude that people bring to the table – not the number of words or images as you say.